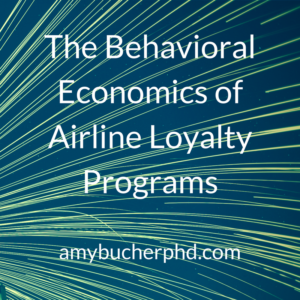 The Behavioral Economics of Airline Loyalty Programs | Amy Bucher, Ph.D.
As a frequent flyer, I know how easy it can be to get caught up in a loyalty program. You could blame it on the occasional first class upgrades, the free checked baggage, or the special elite hotline many airlines offer their most valued members . . . or you could chalk it up to a brilliant application of behavioral economics and psychology. We know from research on behavioral economics that people place irrationally high values on objects they possess versus those they don’t (Kahneman, Knetsch, & Thaler, 1990)–the endowment effect. Airline loyalty programs leverage the endowment effect to great success. A person earns status from among a variety of ranks based on the number of miles flown in a year and the amount of money spent with the airline. Failure to continue traveling and spending at the same rate results in a loss of status. The threat of status loss is highly motivating for some people to take additional trips and choose inconvenient routes in order to fly more miles on their chosen airline. Some people even deliberately schedule layovers to maximize mileage. Airlines are doing something right. Passengers are seated in order of their status level, which means that other passengers can see who boards first and who is left waiting at the gate. The boarding passes have status printed on them as an immediate reminder throughout the boarding and flight process. Passengers may receive inexpensive tchotchkes from the airline celebrating status, such as luggage tags (all the better to publicly decree accomplishment) and membership cards. And passengers with loyalty status accrue points at a higher rate, creating a self-fulfilling cycle where the airline’s desired outcome (more flights sold) feeds into the passenger’s desired outcome (not losing status). Digital health intervention designers could learn from airline loyalty programs to apply loss aversion to the badge or status feature for improved engagement. For example, what if physical fitness apps expired badges if a user didn’t repeat the related accomplishments at least once within a 30 day period? That would help drive ongoing, rather than one-time, behavior. And what if the badges were socially visible to other users of the app? Finally, for the more difficult-to-achieve badges (e.g. feats of endurance or speed), the app could give or sell swag such as t-shirts proclaiming the accomplishment that would offer real-world testament to the user’s achievement (something Flywheel already does for people who earn enough points in classes during a given month). So if you’re building a digital health app, consider taking a lesson from airlines, and include hooks from behavioral economics. Kahneman, D., Knetsch, J. L., & Thaler, R. (1990). Experimental tests of the endowment effect and the Coase Theorem. Journal of Political Economy, 98, 1325-1348.